A few players have reported issues with not earning the +50% bonus on Guild XP. I can confirm that it’s working on adventure writs in Kylong Plains, but other players have posted results indicating that doing Tradeskill Rush Orders in instances (Guild Halls, instance ‘tradeskill cellars’, etc.) may not receive this bonus. Your guild has received 1961 status which includes a 50% server bonus! UPDATE: Since the publication of this article, we have learned that several Heritage Quests, writs, etc. are not providing the +50% Bonus Guild XP. As this was the first bonus Guild XP weekend, no doubt notes are being taken to fix some of these issues for the future. The community team will be hosting a Nights of the Dead Masquerade Ball on the Test Copy server. Go to the docks in Sinking Sands at the proper time and date and take the portal to the community lounge. Find out when, after the break. Challenge: To celebrate Halloween, we’re holding a Pumpkin Carving Forum Challenge. Carve a pumpkin related to the SOE game you play and take pictures of the process. Upload the pictures to an external site, then submit them to us for review. Now, let’s get to carving! It’s a Bonus Guild XP Weekend! Starting at 5:00 pm (PDT) on Friday, October 22nd and ending at 10:00 am (PDT) on Monday, October 25th, players in EQII and EQ2X can gain a 50% bonus on guild XP! Get out there and level up, and enjoy hearing those dings come 50% faster. But don’t wait; the weekend will be over before you know it. Enjoy! This promotion will run from Friday, October 22 at 5PM PDT (Sunday 02:00 GMT) until Monday, October 25th at 10AM PDT (17:00 GMT). As we previously reported, with GU58, the guild XP levels were evened out to get rid of the hell levels. Depending on where your guild was in relation to the closest hell level, you may have gained guild levels or lost progress in your current level. In the grand scheme of getting to level 90, just about everybody ended up better off. In the grand scheme of making it to the NEXT level, which could have been your long term goal, some guilds lost progress. This weekend there will be a guild status bonus weekend where all status that you earn will increase your guild’s XP by 50%. For example, if you complete a writ that awards you 10,000 status, normally your guild will receive 1000 status (xp). With the 50% bonus you’ll still receive 10,000 personal status, but the guild will instead receive 1500 status. The promotion will run from 5pm Friday night until 10am Monday morning (PST). Look for the official announcement coming soon. It’s time to enjoy spooks, frights and other creepy festivities in Norrath! Beginning at at 12:01am PDT Thursday, October 14th and running until 11:59pm Monday, November 8th, the Nights of the Dead celebration brings a bit of seasonal fun to adventurers of all levels! Nights of the Dead summons goblins and ghoulies out of the shadows of Norrath. Those inclined to celebrate the holiday through crafting will find a new book of recipes full of new house items being sold by official event merchants. Those feeling more adventurous can trick-or-treat within Qeynos or Freeport or investigate the multiple haunted locations! But be wary of the strange illness that has been reported near the docks in Nektulos Forest, and of the headless guardsman that has been rumored to wander the paths of the forest, too! Be sure to visit New Halas as they join in the celebration this year. Show your holiday spirit with the new “Nights of the Dead Devotee” quest and get the dish on its cool reward. New rewards for some of the returning Nights of the Dead events. Check out the new costume illusions, a new recipe book and new house items available from Nights of the Dead merchants. The Headless Horseman is back and tougher than ever, and he’s carrying some new loot in his pack. Wandering through Nektulos Forest might provide some spooky fun, too! The Heroes’ Festival has begun! A call has gone out to all Norrathian adventurers to commemorate the six years of questing, raiding, tradeskilling, house decorating and socializing. Celebrators, happy to share in the festivities, can be found in North and South Qeynos or West and North Freeport. You may spot some odd things, due to the overlap of both the Nights of the Dead and Heros’ Festival running at the same time, right now. But keep in mind that this will not be the case when it goes live. Currently, the event is scheduled to run on live servers, 11/19/10 through 11/30/10. If you have any feedback or bugs, please post it in this thread so that we will be sure to see it. Thank you! No word yet on whether the player-submitted paintings (which were available last year for just 6 days) will be available again this year. Game Update 58 is looking to be a massive update, not so much in content, but in changes large and small to the game, and its User Interface. Outdoor Balconies have been added to 6+ room houses, making them feel a part of the city they belong to. House item limits have been increased, and Moving Crates now count independently of house item limits. The adventure Vitality XP bonus remains effective at level 90. Betrayal now suspends your access to spells and spell upgrades you are no longer permitted to use, but does not totally reset them. Should you betray back to your original class, your spells will be restored including any spell upgrades you have purchased or researched. Changing your alignment or citizenship without changing class no longer resets your spells. A fix for the Call of the Veteran to reduce some of the problems, and better messages when it doesn’t work. In recognition of the relative lack of in-game paintings available in EQ2 to decorate the ever-growing variety of housing, including the new Mistmoore Crag Estate, we are happy to see more contests that encourage players to create their own artwork or otherwise contribute content which becomes part of the world of Norrath. For Oktoberfest, contest entries took the form of in-game screen shots of players celebrating and otherwise partaking of festivities in the taverns, bars, and pubs of Norrath. The winners of this contest should make for great decorations in your own celebration chambers. Niami Denmother over at EQ2 Traders has put together some excellent previews of some upcoming crafting updates. Check out the Game Update 58 Crafting, Housing and Event Preview and the Nights of the Dead 2010 Crafting Preview. First off, my appologies for taking so long to post this information but it took me until a few hours ago to understand what was actually going on. It’s been a bit confusing. Here’s what’s happening. In celebration of Oktoberfest, the EverQuest II Community Team will be hosting in-game parties in the Community Lounge. Come socialize, dance, have pillow fights, drink, and be merry. You’ll also be able to tip the barkeeps for some special trinkets! When it’s time for the party to start, we’ll drop a portal near the carpet at the docks in Sinking Sands. Just look for the glowing spot, click, and you’ll be ported right to the Community Lounge. First party on Test Copy server was a lot of fun! And all the portals are up on the US servers. Just going to drop them on the UK servers here in a few, and that’ll be tonight’s festivities. None of us will be present in the lounges this evening. To hang with us, you gotta join us on Test Copy. Once the Test Copy parties have wrapped, the lounges will be open on the US/UK servers for around 6 hours. We decided to try it this way this time around, since there are so many servers… it takes over three weeks to visit every single server for their own party. Phew! We’ll evaluate afterward and see if it’s something we want to do again. Today marks the end of not only a very lucrative Double XP weekend for both my tradeskillers and adventurers, but also the close of the Neriak City Festival in Darklight Wood. A selection of paintings from Notable Norrathians and the Heroes Festival. A key addition to the City Festival were the Notable Norrathians player-submitted in-game paintings. If you have not yet looked at or bought any of these paintings, take your City Tokens to Darklight Wood (druid ring or run from Nektulos Forest). These paintings can be placed in your house or guild hall, and do not have the status cost and guild level requirements of the 5th anniversary Heroes Festival paintings. Double XP weekend concludes at 10:00am PDT (1:00pm EDT, 19:00 GMT+1). City Festival concludes on 2010.09.07 at Midnight PDT (2010.09.08 3:00am EDT, 2010.09.08 9:00 GMT+1). This coming weekend, from 10:00 am PDT on Friday, September 3rd, until 10:00 am PDT on Tuesday, September 7th, we will be running a true Double XP promotion (+100% XP). The bonus applies to AA, tradeskill and adventure experience gained this weekend. Our French, German, Japanese, Test and EQ2 Extended servers will also be enjoying the increase in XP gain. This is reprinted from the original EverQuest2.com article which seems to have gone missing. We are thrilled to make the highly-anticipated announcement of the winners of our Notable Norrathians Forum Challenge! It was not easy to choose just ten out of the amazing entries we received. The talent and creativty displayed were truly wonderful and there’s a certiain very-jealous dark elf in the office right now! We’d like to thank everyone who submitted an entry (the dark elf made note that she’s saving a few for her own desktop wallpaper) and we invite everyone who didn’t win this time to resubmit the next time we have a similar challenge. The EQ2 User Interface has received a facelift, with a new toolbar, a refresh of various windows, and a merged Character/Inventory/Profile window. The default theme is red, but easily switchable to blue by typing /loadui and choosing the Blue graphic set. More character classes are now neutral and may start in either good or evil cities. Spell animations and effects have been revamped. Intrazone travel now supports path linking. Travel within Kingdom of Sky has been improved. Erudin group instances (level 86-90) are now easier to reach. New tradeskill quests have been added in the level 10, 20, and 30 tiers. These quests reward a mount as well as access to what have previously been overpriced Advanced recipe books. Starting areas in Greater Faydark and Darklight Wood have received substantial revamps. Gorowyn has received further architectural rebuilding to improve navigation. All classes have had some group-specific spells postponed until later levels to reduce the number of spells new players get in the first 20 levels. Fighter heals will no longer critically heal. 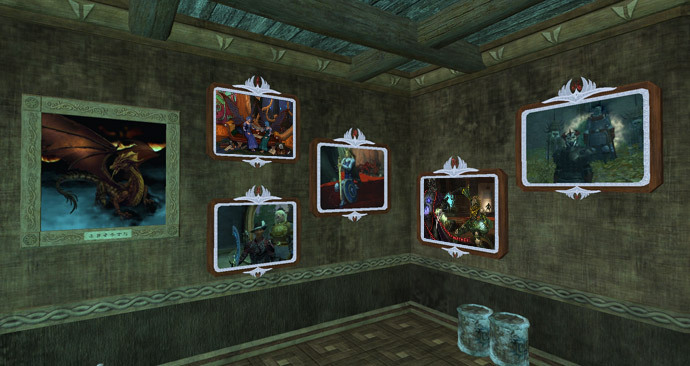 The “Notable Norrathian” contest winning paintings are now available within Norrath but only during the monthly City Festivals (next is Sept 1-7). They are guild hall placeable. Lucan D’Lere has returned to Freeport. Today’s update contains no new dungeons or raid zones. Also going live today is the public beta for EverQuest II Extended, the Free-to-Play alternative to a monthly EQ2 subscription. Game Update 57 will arrive simultaneously on both servers. EQ2X, as it’s being abbreviated, may be discussed on the separate EQ2X Forums. All U.S. EQII servers are scheduled to come down on Wednesday, August 18 at 5:00 AM PDT for Game Update 57. Servers are expected to be offline for around 4 hours, coming back online around 9:00 AM. The UK servers will be updated according to the usual schedule. What about those Notable Norrathians paintings? Kaisha has dropped some hints regarding how the 10 winning paintings will become available. If our interpretation is correct, it looks like they may be available from the City Festivals for 10 city tokens each. We’ll post the Game Update notes when they become available (assuming we’re awake!). Apologies for any typos. They jacked up the AC in here!! Remember folks, lots of EQ2 t shirts, hoodies, and polos. Live blog from Fan Faire with q&a on EverQuest II. 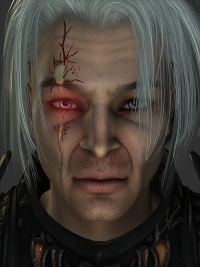 Energized Taehric Construct (challenge mode): The Construct will try and cast Crippling Judgment on his main target whenever possible, rather than a random fighter. The construct will try and cast Curse of Befuddlement on priests in separate groups, whenever possible, avoiding casting it on two priests in the same group whenever possible. The Twisted Alloy Wristlet’s proc, Torturous Paths, has had its damage increased and its proc chance raised. Many mage items within Underfoot Depths have received pet effects. The Tinkerfest quest “Great Balls of Fire” cannot be completed more than 25 times. The Tinkerfest titles awarded by the repeatable Tinkerfest quests can now be purchased from the Tinkerfest merchant if you have earned them but did not receive them. We’ve got Live Coverage of the SOE Block Party by Serianna of Crushbone! If you couldn’t make it to the SOE Block Party, you can still keep up with what’s going on! Serianna is sending us updates and photos from the ground. Watch Out for Exploding Gadgets…. It’s Tinkerfest! Tinkerfest is a wonderful time each year that players get to experience the zany background of the gnomes and their kooky inventions. What will go boom this time, who will be the new victim or merciless tests with flaky machinery!? When will the madness end? Starting Friday July 23rd at 12:01am PDT Tinkerfest will be in effect. Bringing to you several quests, lovely house items and fluff and yes, the shinies are back! Be quick to jump on this upcoming weeks event as it will only be available for a short time, ending on August 2nd at 11:59pm PDT this event will wrap up like one of Cinderella’s pumpkin carriages and vanish till next year! For a complete quest/event list there are writeups at EQ2 ZAM and EQ2Traders. There’s still a short time to register for Fan Faire 2010! Registration will be closing at 11:59 pm PDT on Friday, July 23. Platinum passes are sold out, but a limited number of Silver and Gold passes are still available. As always, Fan Faire registrants will receive some special in-game items. Depending on the level of pass you purchase, you’ll get either one cool EQII item, or two cool EQII items. We wanted to give you a sneak peek at the these items, so scroll down to see the goods. And remember, Silver, Gold and Platinum attendees will get in-game items for every eligible SOE game they have an account for! To see the full list of this year’s items, visit the SOE Fan Faire FAQ page. We have not been posting individual announcements about the recurring Moonlight Enchantments and City Festivals because we have that information in our new Calendar which appears in the left sidebar of EQ2Wire at all times. Due to a glitch in the activation of the Moonlight Enchantments event, the event has been extended to July 22nd. Also, yesterday, I tweaked the sidebar Calendar to display multi-day events just once per month. As a result, I have been able to correct the dates on upcoming recurring events.